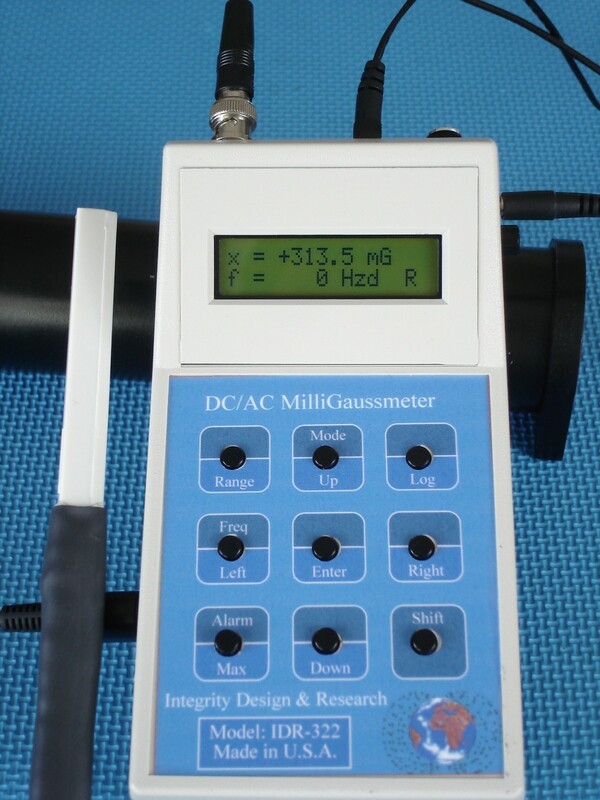 Low Cost, High Quality DC Gaussmeters, Highly Recommended! Made in the U.S.A. by Integrity Design & Research Corp. Typical Applications include Measurements of the Earth's field vectors, Air shipment inspection, Mapping and recording field perturbations, Magnet classification, Analysis of magnetic circuitry and components, Magnetic Resonance Imaging (MRI) and Measuring residual fields. Excellent Resolution: @ scale 2 G: 1 mG, @ scale 20 G: 10 mG, @ scale 200 G: 0.1 G & @ scale 2000 G: 1 G.
Typical application: Residual magnetic field, Magnetic Resonance Imaging (MRI), classify magnets, etc. Resolution: @ scale 20 G: 10 mG, @ scale 200 G: 0.1 G, @ scale 2 KG: 1 G & @ scale 20 KG: 10 G.
Typical application: Residual magnetic field, classify magnets, Audio speaker magnet, etc. Resolution: @ scale 2: 1 uG, @ scale 20: 10 uG, @ scale 200: 100 uG & @ scale 2000 mG: 1mG. Battery Life: About 15 hours continuous use with 9V alkaline . Typical applications: Earth's field vector measurement, air shipment inspection, mapping & recording field perturbations, etc. Typical application: Earth�s field vector measurements, air shipment inspection, Electric motor, coils and solenoids, AC EMF interferences, MRI, industrial, scientific & medical equipments, low residual magnetic fields, Breaks in magnetized steel cables,etc. Wonderful low price on this True RMS multimeter datalogs up to 43,000 data points at capture rates as fast as 20 times/second! You can use it as a stand alone or connect it to your PC with the built in RS-232 serial interface to collect and analyze long term data on AC/DC voltage (0.01mV -1000V), AC/DC current(0.1UA to 20A), Resistance(0.01Ohm to 50MOhm), Frequency (10Hz - 125kHz), Capacitance(0.01nF to 999Uf) and Diode test! Can be used with any analog output like Geomagnetometer(IDR-321), DC Gaussmeter(IDR-309 & IDR-329) & AC Milligaussmter(IDR-109, IDR-119, IDR28, IDR-28), etc. Includes powerful Windows based software which allows users to determine sampling rate, live Analog and digital displays on the PC screen, plot data with Max/Min values, easily Save data to a file, limit comparator with GO/No Go displays and alarm. Requires minimum 16MB RAM. 3-years mfr. warrantee. Perfect for connecting DMM to meters with 1/8" jack output. 1/8" plug on one end, dual banana plug on other end. Perfect for connecting DMM to meters with RCA jack output. RCA plug on one end, dual banana plug on other end. Two cylindrical tubes are equal in length (12"), one is inside the other, both of them are closed at one end. At the other end, the inner tube is open (Radius=1"). The cylindrical tubes are made from high permeability material. The magnetic field inside the inner tube is almost annulled. 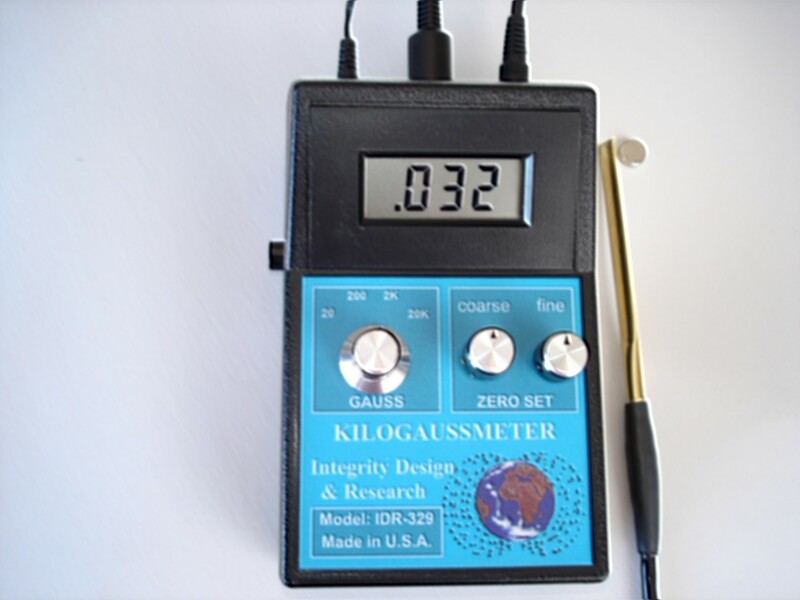 The 5100 Series hall effect portable Gauss/Tesla-Meters represent the recent design from the world leader in magnetic AC & DC measuring equipment. This new design incorporates the use of digital signal processing technology making it the world's first hand-held gaussmeter to have a digital signal processor (DSP) on board. 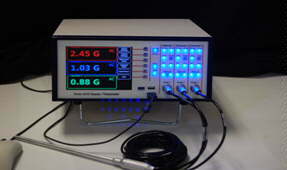 F.W.Bell's exclusive Dynamic Probe Connection allows measurements from 0 to 30 KG with basic accuracy of 1%. Typical applications include: Magnetic Testing & Classification, DC & AC Motor Testing, Magnetic Field Mapping, Residual Field Testing, Relay and Solenoid Inspection. All instruments are CE Compliant. The 5100 Series Hand-Held Gauss/Tesla-Meters' built-in software eliminates the need for complex calibration procedures. User prompts on the custom formatted LCD allow fast, simple push button operation. All models (5170 & 5180) come equipped with a detachable transverse or axial probe, zero gauss chamber, instruction manual, hard carrying case, four AA batteries and Adaptor. Axial, ultra thin transverse and other style probes are available as options. "High permeability Material excellent for Shielding DC, ELF & VLF Magnetic Fields"
Magnetic shielding material protects electronic circuitry, electron beam in a cathode ray tube like VDT, TV, computer etc. and also it separates the victims from magnetic interference (EMI). Usually, the sources of this interference are permanent magnets, transformers, motors, solenoids and cables. It is now available at affordable prices for home and office use. This ferromagnetic alloy (80% nickel, 15% iron, 4.2% molybdenum) is easy to trim with scissors and shape by hand. Can be formed into magnetic barriers on VDTs, buried wiring, speaker and more. With snug fitting shapes, get as much as 70% attenuation of the magnetic field with one thickness. Use multiple layers for even greater reduction. The shield shape plays an important role in the reduction of the of the magnetic sources. Closed shapes are the most effective for magnetic shielding such as cylinders. 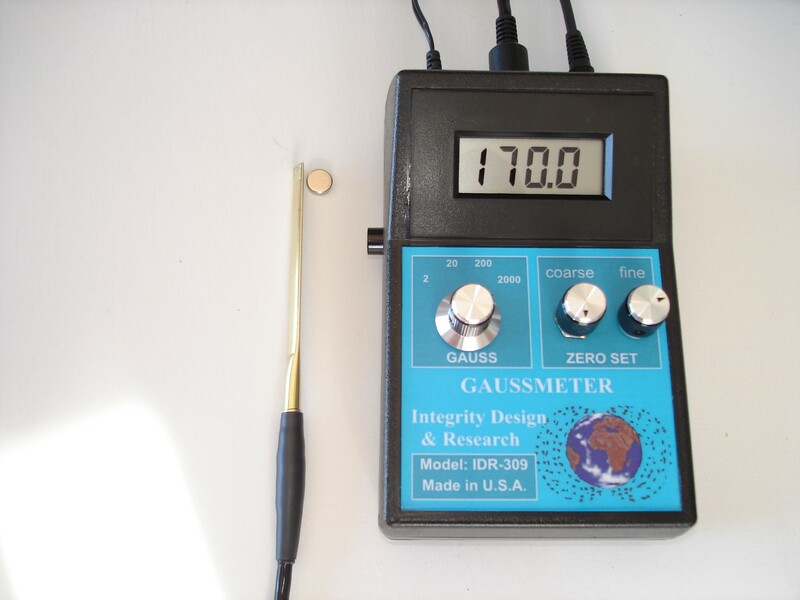 We recommend the use of an accurate gaussmeter made by Integrity Design to determine the proper shape and positioning of the shielding, and to confirm that the fields have been adequately reduced. Provides protection against AC & DC magnetic field radiations. one layer of shielding provides 50-60% attenuation at 60 Hz or even more. The Model 6010 Hall-effect gaussmeter represents the latest innovations and state-of-the-art designs from the world leader in magnetic measuring equipment. F.W. Bell's exclusive Dynamic Probe Correction feature, along with temperature compensation, allows measurements up to 300 kG with a basic accuracy of 0.25%. User prompts on the custom formatted LCD allow fast, simple push button operation. All models come equipped with a zero gauss chamber, accessory hard case, built-in rechargeable battery, quick reference card and instruction manual. A wide range of axial and transverse probes are available as options & sell separately. Applications for the Model 6010 range from the most sensitive laboratory environments to rugged industrial settings. All instruments are fully CE compliant. Exactly What You've Been Waiting For! The F.W.Bell The Model 8010 single-channel GAUSS TESLA METER from F. W. Bell leads the way for advanced Hall Effect magnetic measuring technology. The easy-to-use front panel programming feature incorporates the latest in user control operations. 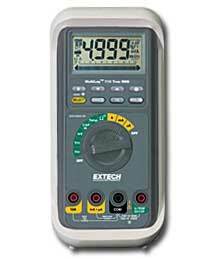 And the 8010 is capable of measuring and displaying seven different parameters, including flux density, frequency, temperature, min, max, peak and valley. This high accuracy instrument is fully equipped to meet most magnetic measuring applications. Bell's dynamic probe correcting software increases the 8010 measurement capabilities to make it the most versatile magnetic measuring tool in the world. Key features include high-resolution, high-accuracy and high-speed with a large TFT color LCD display with backlighting. The 8000 features 50 kHz frequency response, temperature and frequency measurements, auto zero, auto range, hold functions for peak, valley, min and max, corrected and uncorrected outputs. The Model 8010 provides the user with gauss, tesla, Oe, A/m, IEEE-488, RS-232 , Ethernet RJ-45 and USB communications ports and classifier output. The 8010 operates with Bell's sixth generation Hall effect probes. These probes provide temperature compensation and measurement readings (0�C to +70�C) while monitoring the magnetic field. The easy-to-read TFT Color LCD with Backlighting is easily viewable in most light conditions and can be customized to meet a user's specific needs. Applications range from basic magnetic measuring to sensitive complicated three-axis vector summing requirements. The F.W. Bell Model 8010 is fully CE-compliant. 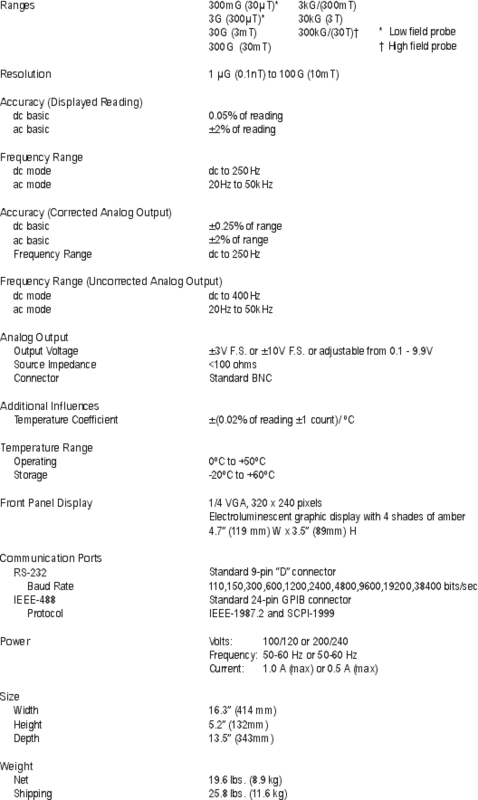 seven different parameters per channel -- 27 total parameters for the 7030 three-channel model. The single-channel 7010 and three-channel 7030 models are high accuracy instruments fully equipped to meet most all magnetic measuring applications. And F.W. Bell's exclusive dynamic probe correcting software actually increases the 7000 Series measurement capabilities to make it the most versatile magnetic measuring tool in the world. Key features include high-resolution, high-accuracy and high-speed with a bright 1/4 VGA display. The 7000 Series features 50 kHz frequency response, a 100 samples-per-second update rate, temperature and frequency measurements, Auto Zero, Auto Range, Hold functions for Peak, Valley, Min and Max, corrected and uncorrected outputs for each channel and Vector Summation and angle (three-channel model). The 7000 Series provides Gauss, Tesla, Oe and A/m, as well as IEEE-488, RS-232 communications ports and Classifier output, and are fully CE compliant. 7000 Series probes - A complete line of precision probes, with enhanced performance on the 7000 series instrument. 7000 Series Soft Carry Case - A rugged case with locations for manual and probes. 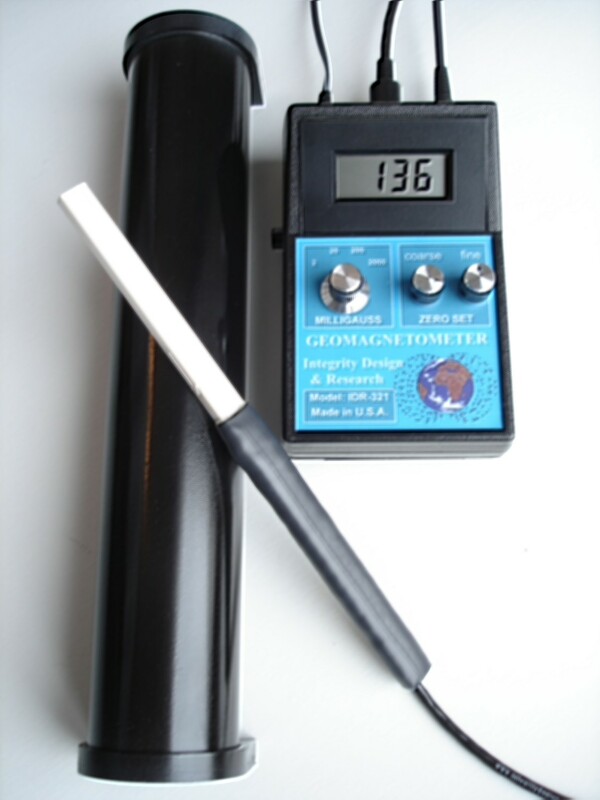 Reference Magnets - Used to verify the calibration of a Gauss/Tesla-Meter. 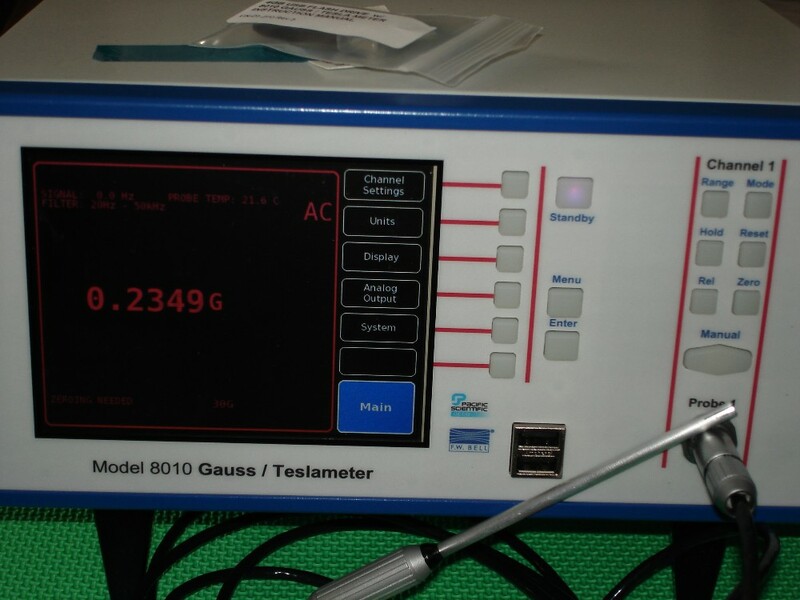 The Model 8010 single-channel Advanced Gauss/Tesla-Meter from F.W. Bell is capable of simultaneously measuring and displaying seven different parameters per channel -- flux density, frequency, temperature, min, max, peak and valley. Key features include high-resolution, high-accuracy and high-speed with a large graphic electroluminescent display. The 8010 provides 50-kHz frequency response, temperature and frequency measurements, Auto Zero, Auto Range, Hold functions for Peak, Valley, Min and Max, corrected and uncorrected outputs for each channel and Vector Summation and angle. The Model 8010 provides the user with gauss, tesla, Oe, A/m, IEEE-488 and RS-232 communications ports and Classifier output. The 8010 operates with Bell's fifth generation Hall Effect probes. These probes provide temperature compensation and measurement readings (-40�C to +100�C) while monitoring the magnetic field. Applications range from basic magnetic measuring to sensitive complicated three-axis vector summing requirements. The Model 8030 three-channel Advanced Gauss/Tesla-Meter from F.W. Bell is capable of simultaneously measuring and displaying seven different parameters per channel -- flux density, frequency, temperature, min, max, peak and valley. 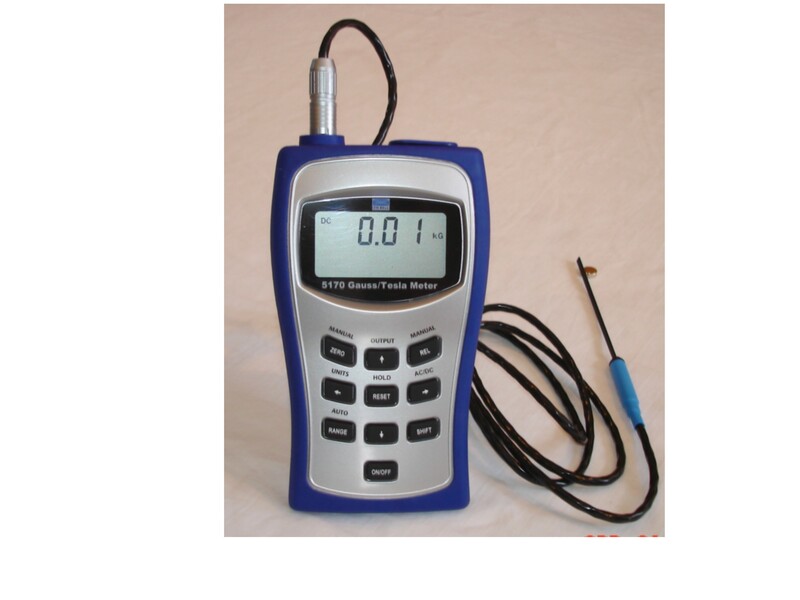 With its vector summation feature, the 8030 can measure and display a total of 27 different parameters. Key features include high-resolution, high-accuracy and high-speed with a large graphic electroluminescent display. The 8030 provides 50-kHz frequency response, temperature and frequency measurements, Auto Zero, Auto Range, Hold functions for Peak, Valley, Min and Max, corrected and uncorrected outputs for each channel and Vector Summation and angle. The Model 8030 provides the user with gauss, tesla, Oe, A/m, IEEE-488 and RS-232 communications ports and Classifier output. The 8030 operates with Bell's fifth generation Hall Effect probes. These probes provide temperature compensation and measurement readings (-40�C to +100�C) while monitoring the magnetic field. Applications range from basic magnetic measuring to sensitive complicated three-axis vector summing requirements.